I was in Bruges with my mum and sister on the trail of Nicholas, who used to be Claes and who answered to the Milanese as Niccolo. Should you be a fan of Dorothy Dunnett novels all will be clear, if not, let me explain . . .
Nicholas is the hero of Dunnett’s House of Niccolo series which opens in Bruges in the early 1460’s. The city is alive and prosperous, a centre of Medieval trade frequented by merchants from Italy, Spain, Scotland, England and further afield still. Clever, with a gift for figures and a talent for absorbing languages in the space of the first book Nicholas intrigues his way from genial dyers apprentice and servant to merchant adventurer with the attention of the powerful Medici and others in high places. It’s delicious stuff, swashbuckling fiction, peppered with real characters, woven through with historical detail. 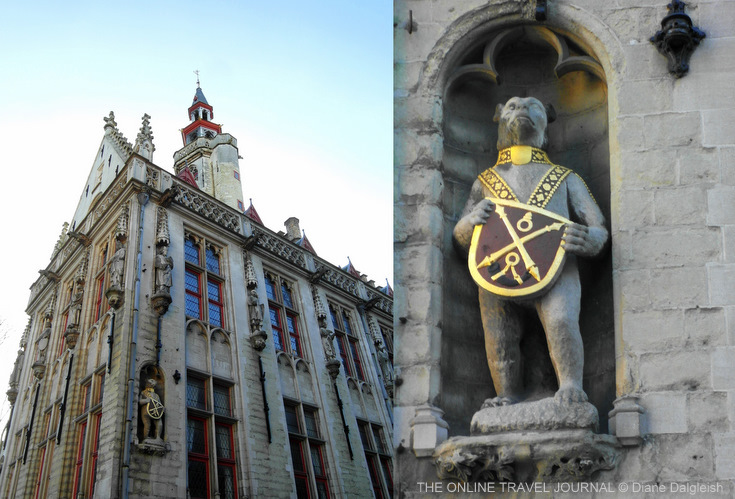 Bruges is ideal for walking in the footsteps of historical characters real or imaginary. Many of the important buildings from the city’s heyday and before, like the Belfry and the Guildhall are still in use but more than this it’s the atmosphere in quiet corners, or the sight of a diamond paned window over a canal that leaves you feeling you wouldn’t be at all surprised to meet a burger in robe and hose coming around the corner (Dunnett’s good on fashion). That the essence of 15th century Bruges is still palpable is probably due to the city’s long slumber; for when the channels that brought the trading ships silted up, merchants went elsewhere and the city lost the patronage of royalty leaving its cobbled streets and canals undisturbed for hundreds of years. “You did well picking a hotel in Kateljnestraat”, said my mum on hearing where we were staying. Nicholas is prone to ending up in canals, indeed Katelina and her sister Gelis rescue him from one on the night of the masked Carnival. This canal bordered by the old Hospital of St John was just along the street from our hotel. Painter Hans Memling was once a patient in the Hospital, which dates back to the 12th century, and six of his works can be seen in the chapel. Elsewhere in the building, now a museum, an exhibition tells the story of medical care in the Middle Ages. Opposite the hospital is The Church of Our Lady (Onze-Lieve-Vrouwekerk) where the noblesse of Bruges (Nicholas amongst them) gathered to mourn the death of Scottish King James, retiring afterwards to the adjacent Hôtel Gruuthuse home of Louis de Gruuthuse. The Gruuthuse family made their money from gruit, a herbal mixture used for flavouring beer and rose to become influential courtiers of the time. During a rainy spell we visited the Gruuthuse Museum housed in the former palace for a sense of how they lived. There’s a private chapel from which the family could look down on the services in the Church of Our Lady without having to leave home. The belfry has stood on the Markt in the heart of the city for centuries, providing a lookout post, its bells keeping the pattern of the day for the citizens of Bruge . It was shorter in Nicholas’ time, as work on the octagonal tower taking it to 83m didn’t started until 1483. In more recent times the belfry has featured in the film, In Bruges – a dark comedy in which the 366 steps to the top play their part. Foreign merchants from the various trading nations had their own communities and maintained separate lodges in Bruges where they would stay and store their merchandise. On the left above is the former Genoese Lodge, home these days to the Fritesmuseum dedicated to potato fries. 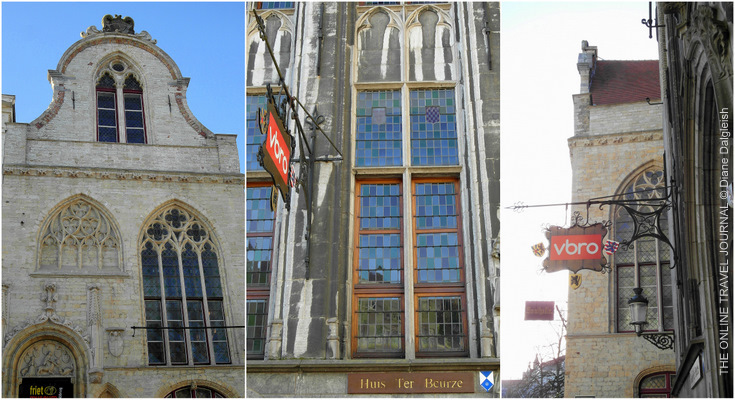 Next door is the Huis Ter Beurze, possibly the first stock exchange in Europe – it started life as a 13th century inn known as the place to go for trading advice. The former Florentine lodge, now a restaurant stands opposite and nearby stood the Venetian and Lucchese lodges too. Going up in the world Nicholas was no stranger to these parts calling with news to impart and letters to deliver. Foe Simon of Kilmarren is below, his dog dead; Claes appears arms around the bear, stained club in hand – did he do it ? The Burgher’s Lodge was the place where wealthy citizens and foreign merchants met socially and the little bear lodging in the niche a symbol of Bruges. It’s maybe a 10 minute walk from the centre of Bruges to the Jerusalem Kerk in a quiet corner of the city. The private church, said to be modelled on the Church of the Holy Sepulchre in Jerusalem was built by the family of Anselm Adorne, a prominent merchant and city elder of Genoese descent, who is one of the real life characters in the series. Bruges is full of bridges, this is one of the oldest dating from 1391 when it was built to provide Augustinian monks from the nearby monastery with a short cut into the city. Here you have to imagine the unlikely sight of an ostrich in full flight, Nicholas astride hanging on with one hand as he tries to get control of the bird. The present surroundings seem too ordered for such a caper but Nicholas surely trod this way. We travelled with Niccolo Rising, the first book of the House of Niccolo series – still fresh in my mind since as I’d only just finished reading it – and the Dorothy Dunnett Guide to Bruges, a companion book to the novels and good read in itself, which links locations with events in the book. We also had a well illustrated Insight Guide Book to Bruges that proved very informative and suggested a number of walks. Definitely for me the best way to see Bruges is on foot. Tidily confined by the canal and flat it’s easy to walk and away from centre surprisingly quiet. It’s good to take your time, enjoy the sights, pausing of course, to sample some local beer or a chocolate or two. We succumbed early on to a splendid patisserie, on account of it being a bit damp and cold you understand. 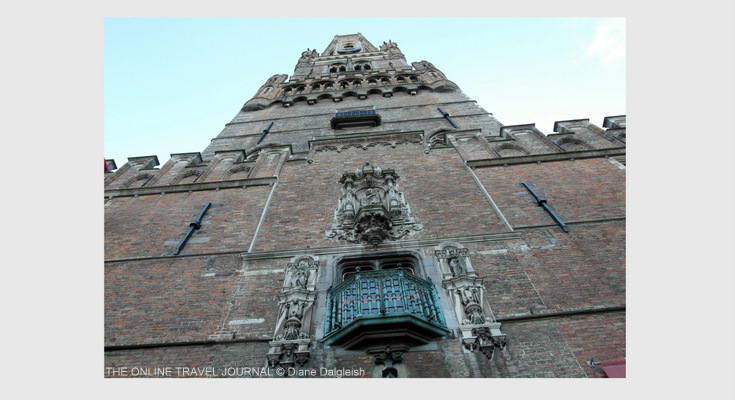 Besides the books mentioned the official Bruges Visitors Guide from has some suggestions for themed walks with maps or you could plan your own tour in Tourist Information centre situated in Historium Brugge on the Markt. And should you become a little foot weary you could always take a boat trip around the canals to see Bruges from a different angle. The web site has information on the places mentioned above plus many more you might like to visit. We travelled from the UK by train, taking the Eurostar from St Pancras International in London to Brussels , then onward by local service to Bruges. We stayed at the Hotel Loretta in Katelijnestraat which I’d recommend as a friendly, tidy, comfortable hotel in a very convenient location.